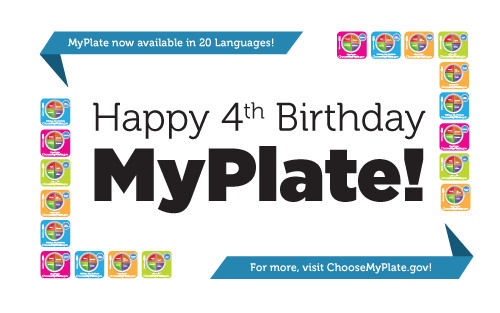 Celebrate MyPlate’s 4th Birthday All Week Long! // Today is MyPlate's birthday and we want to celebrate this milestone with you! It was exactly 4 years ago today, on June 2, 2011, that MyPlate was first introduced, replacing the food guide pyramids with which many of us grew up. MyPlate has been inspiring healthy plates for 4 years! And now we have a library of MyPlates in multiple languages for you to use and share. Adding to the English version and the Spanish MiPlato, this suite of MyPlate icons in 20 languages is accompanied by a translated tip sheet. The translated resources can be used by educators, public health groups, and others to reach more Americans with healthy eating messages based on the Dietary Guidelines. Find tips for enjoying foods from many cultures here. Join our celebration all week long on Facebook or Twitter and tell us what MyPlate means to you!